In partnered social dance, success is achieved through two separate yet equally important roles: Leaders, who initiate shapes and patterns, and Followers, who respond and embellish on those cues. These are their stories. DUN DUN. A Leader is responsible for suggesting the shape of the dance to come. You may like to Lead if you enjoy: planning ahead, setting goals, being a team leader, responding gracefully to constructive feedback, party-planning, making up stories and games, setting people up for success. A Follower is responsible for interpreting or elaborating on a suggested shape and providing a foundation for the next shape. You may like to Follow if you enjoy: going with the flow, responding quickly to a crisis or knock of opportunity, being a valuable team member, inspiring others, saying the exact right thing at the right time, entertaining yourself, asking that everyone (including yourself) be their best selves. On today's dance floor many Leaders are men and many Followers are women, but in fact (especially during intense gender segregation like wartime) people would practice and dance and enjoy themselves with partners regardless of gender. We encourage you to widen your dance experience by respecting everyone's preferred role and actively asking those in unusual roles to dance. People who have learned to both lead and follow are called Ambi-dancers; most instructors and dance veterans are ambi-dancers by profession and/or interest. Some even look for Switch dances where they seamlessly trade off roles within the same song, allowing for a wider range of expression and creativity to their favorite tunes. Ask others what they would like to dance when you're on the floor; their answers may surprise you! Young women dancing. Photograph by Peter Stackpole. Louisiana, USA, 1942. 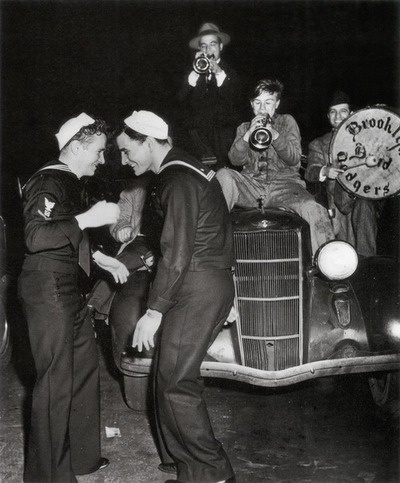 "There Was Dancing" Brooklyn, 1945. By Weegee (Arthur Fellig). Sailors. WWII.